Beans are great for humans and surprisingly good for dogs too. But just as with most human meals, some beans are surely off-limits. The benefits of beans are abundant: those contain magnesium, B-vitamins, potassium, and iron – all fantastic nutrients for your pet. And are also a rich source of antioxidants, proteins, and fiber. Yet, not all beans are equally healthy for your dog. The following text will cover all the types of beans the dog can and cannot eat. We sprinkled our research with some comments from established vets, so really hope you’ll feel like a pro upon finishing reading this article. Let’s dig in into the more in-depth details. Are green beans good for dogs? Can dogs eat raw green beans? Can dog have black beans? Can dogs eat lima beans? Can dogs eat pinto beans? Can dogs eat kidney beans? Can dogs eat garbanzo beans? Can dogs eat refried beans? Can dogs eat baked beans? Can dogs eat canned beans? Pretty often dog owners are concerned about their pets’ weight. (If you are amongst them you might want to check our guide on how to put your dog on a diet). Creating a habit of giving your dog green beans as a treat can help with that, as long as some exercising also involved. You might also have heard about the “green bean diet” as a method to help a canine lose weight. This diet program increasingly substitutes green beans instead of a percentage of a dog’s meal. For example, you start out with 10 percent of the volume of dog’s regular meal substituted with green beans and raises the percentage over time. The ratio can go as high as 50/50, until the pet reaches his recommended weight. Then regular food gradually reintroduced back to the pet’s diet. Chopped, raw, or steamed, — all varieties of green beans are safe for canines to eat is those are plain. Green beans are not only harmless for dogs, but veterinarians actually suggest them as a healthy treat. Best of all, dogs appear to like them. But here’s the thing: green beans are happened to be cooked with other ingredients. And here’s where it can suddenly turn from healthy to dangerous. But why green beans are good for dogs anyway? Nutritious, rich in fiber and moderate in calories, those are great to load dogs up vitamins ( vitamins A, K, B6, C, iron, calcium), when appropriately consumed (fresh beans, no added salt). Your dog does not inevitably need these additional nutrients if he is already keeping a balanced commercial diet, but it is pleasant to know that green beans give a nutritional option to dog biscuits. And, well, if the weight control is your pup’s case, green beans is something to be seriously considered. 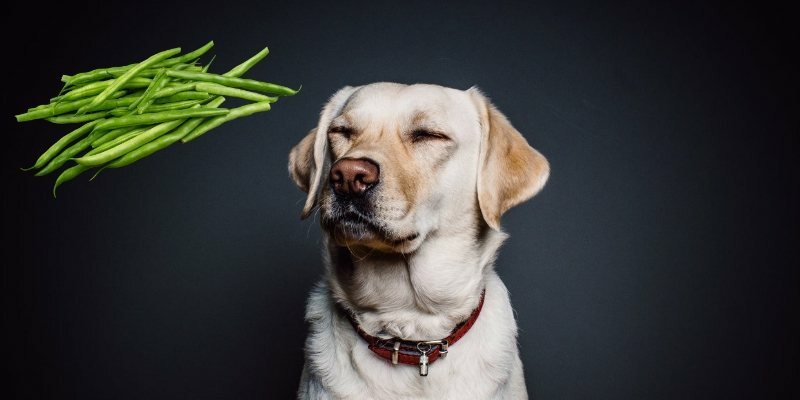 Green beans are an outstanding source of magnesium, fiber and lots of vitamins: A, C, and K. The fiber in green beans will make your dog feel full longer without consuming extra calories. Magnesium helps the body assimilate other nutrients more efficiently; vitamin A is good for your dog’s eyes; vitamin C supports the immune system and helps regulate the blood pressure. As for vitamin K – it’s a great aid in injury recoveries. As their green relatives, black beans are also an excellent source of vitamins C, and K, and also manganese. 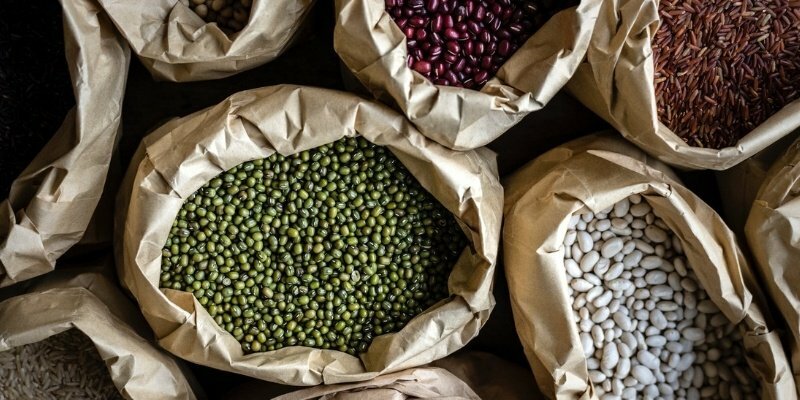 These legumes are also rich in fiber and protein, and those two are perfect for regulating your dog’s blood sugar levels, and stimulating the immune system. So, your dog definitely can have black beans and most likely will enjoy it if consumed in moderation with other food. Avoid canned or raw black beans though. These are forbidden because if eaten, these could block their airways or intestines. The best way to incorporate it into the pet’s diet is to let it soak overnight and then cook. Thus it can be mixed with meat, rice, or other veggies. Or you can give the small portions of cooked beans as a healthy snack. Remember: beans are your pet friends in moderation. An excess amount of black beans can lead to bloating, indigestion, gas, etc. These tiny legumes make a great meal if you’re looking for a healthful way to indulge your pup. They’re nevertheless a great source of protein, fiber, and good carbohydrates. Which means they can sit beside the other ingredients of your dog’s diet beautifully. Just like for us, humans, fiber is essential in a dog’s nutrition. It provides a lot of help to the digestive system. Not only does it keep bad bacteria colonies from developing, but it also assists the colon in healing from injury and stress, and can reduce both constipation and diarrhea. Moreover, fiber can also help your pet support a healthy weight. Similarly to humans, fiber is difficult for dogs to digest. And it’s not a negative! This slow digestion stops the bloodstream from being assaulted with sugars all at once and, as follows, helps keep your dog’s blood sugar levels in order. Some things to keep in mind when thinking of incorporating lima beans in your dogs’ diet: you want to avoid canned produce at all cost. It contains harmful preservatives, and you don’t want those in your pet’s body. It’s best to purchase dried beans and cook without seasoning after soaking it overnight. You can blend cooked beans with rice and meat or give it as it is as a nutrient-rich snack. And, as with all beans – the rule “everything in moderation” is gold. The occasional portion of lima beans is excellent, but any dog requires a diversity of foods! Pinto beans are an exceptional source of protein and cholesterol-lowering fiber. Those beans are also loaded with magnesium, which helps your pet absorb and benefit from vitamin C. When matched with brown rice, pinto beans give a meal that’s dense in protein with zero fats added, though dogs do also need meat as a protein source in their diet. But the more protein and the less fat, the merrier. Your dog will like pinto beans in small portions if they are cooked properly: after they’ve been softened (put it in water overnight) and cooked (no seasoning, please!). Your dog will enjoy pinto beans mixed with meats, rice or other grains and veggies in a homemade meal. And, of course, don’t forget to avoid canned and raw versions of pinto beans to keep your pup’s digestion ticking. Kidney beans have a long story in healing use and food consumption worldwide. Those are popular supplements to various cuisines due to their nutrition benefits: high protein, minerals, vitamins, and polyphenols. Kidney beans are also rich in antioxidants and our favorite fiber, great support for a regular bowel movement and will be just fine for your dog if used in moderation. All those elements are promoting colon health and reducing blood sugar and cholesterol levels. For those reasons, they may be suitable as a component of a weight loss diet. Dogs will like kidney beans that are cooked. It’s best to buy the legumes in bulk, soak it overnight, and steam them without seasoning or spices. Remember, that raw kidney beans contain dangerous toxins that your dog’s stomach won’t appreciate. So, always cook the kidney beans before letting your dog eat it. Garbanzo beans, also recognized as chickpeas, are amongst the beans that are harmless for dogs, as long as they are prepared plainly. It’s a valuable source of magnesium, potassium, and folate that are essentials for cell healing and excellent health. Chickpeas improve blood sugar regulation, eye health (they contain Vitamin A), and the immune system (thanks to Vitamins B and C). Full of fiber, they can also help in doggy’s digestion. Though too much can be a reason for excess gas. 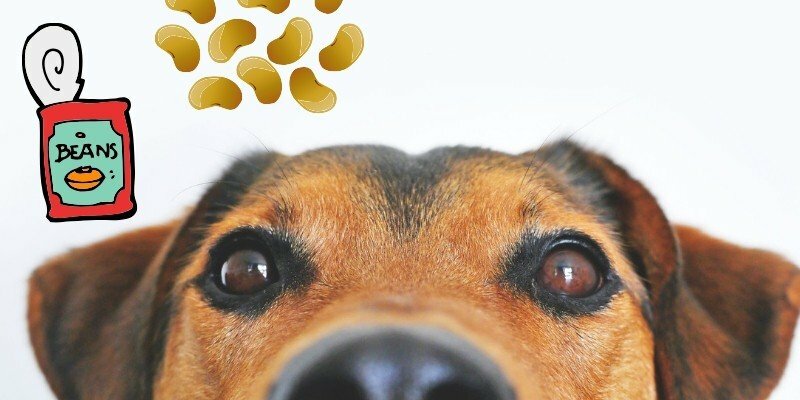 Garbanzo beans are viable food for dogs and lately were being more regularly used by dog food producers across the globe as an ingredient in their recipes. Admittedly, for the prior decade or so, there has been a strong movement into grain-free pet menu, giving rise to the adoption of alternative carbs such as Garbanzo Beans, and Sweet Potatoes. Some stats are the following: according to petfoodindustry.com in the dry dog food market, chickpeas were noticed in roughly 11.5 percent of the analyzed dog food formulas. While it’s obvious that the rate of chickpeas in dog food isn’t as high as other ingredients, like rice, it is still substantial and apparently keeps growing at a rapid pace. With all that being said, you have to remember that you should never, under any conditions, give your dog chickpeas with garlic or onion, and don’t ever feed your pet with hummus as it can be prepared with dog toxic ingredients like lemon juice or garlic. Refried beans are not suitable for dogs, the fast and easy beans preserved in the jars aren’t great for dog’s health, because of the added preservatives that might be dangerous for your dog. Refried beans also include spices inappropriate for a dog’s well-being. We are talking garlic again, and some more, e.g., canola oil, cumin, chili powder, etc. Refried beans can lead to various problems for a dog’s health – starting from abdominal pain to vomit and diarrhea. And if you don’t count on it to happen better avoid refried beans. The rule of thumb is that dogs don’t require the same sort of flavorings or variation of foods which humans appreciate. Dogs want meat. Find a dog food that your pet is ok with (i.e., not allergic to and eat with joy) which has a decent ratio of meat as the first ingredient (not filler grains or other fillers). Add anything else you want to add (e.g. viable grain-free sources of proteins and fiber, like beans), and that’s a simple recipe for a happy pup. But pick the fillers wise. If we are talking about baked beans it’s a no-no. Tomato sauce in baked beans can cause stomach upset and maybe other digestive problems. Canned beans have some preservatives and additives that can negatively impact your pet ’s well-being; they can also grow your pet’s chance to become obese. Moreover, canned beans include high quantities of sodium which is not safe for your pet. – after that, you can offer your recovering pup a little bit of safe food, e.g. plain cooked rice and chicken. That type of food will be easier for him to digest than normal dog food. – If he does not have diarrhea, for an hour he can slowly have more of the rice and chicken dish. – To help calm his stomach you may give your pet Pepcid and Pepto bismol. – If he is under 20 pounds – an appropriate amount would be 1/4 of a Pepcid tablet per 8 hours. – He should be better in one day. If he is not, then he should meet his vet. Wrapping up with the question “Can dogs eat beans?” we want to mention that like any other foods, too many beans are no great. Feeding more legumes can generate excessive gas in your dog which may lead to constipation. Although beans are incredibly healthy, these are human foods and should be supplied in moderation. You still have to give your dog its regular dog food. Beans should be given from time to time as a filler or as a healthy snack treats only.